CodinGame Blog: Come meet us at Developer Week and try San Francisco 2442! Come meet us at Developer Week and try San Francisco 2442! We are really excited to let you know that we will be in San Francisco from February 12 to 17 at DeveloperWeek! Come meet our team at our booth, grab goodies, challenge us on live clashes, and try the new AI game we designed for the occasion. DeveloperWeek is San Francisco's largest Tech event, taking place from February 12 to 17 at Pier 27. More than 3,000 tech professionals will be participating and great tech speakers will be part of them, such as Kevin Scott from LinkedIn or Kit Colbert from VMware. Why are we sponsoring this event? 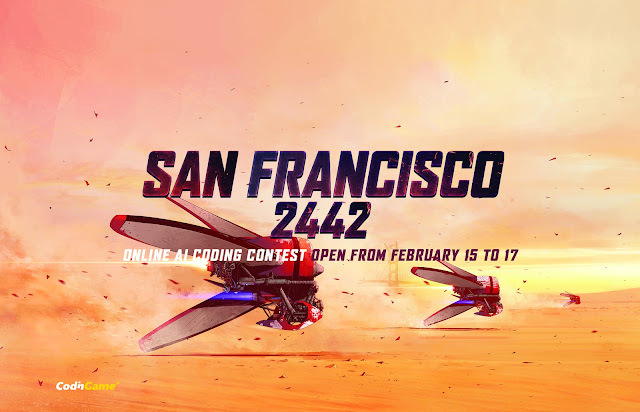 Come and try San Francisco 2442, our new AI game! We’ve also crafted a special AI programming game for the event called « SF 2442 ». For those who would like to play while visiting the conference, we will be giving away 200 DeveloperWeek open tickets! If you are interested, just register for free to SF 2442 and select « I register to the contest and want a free pass for DeveloperWeek ».